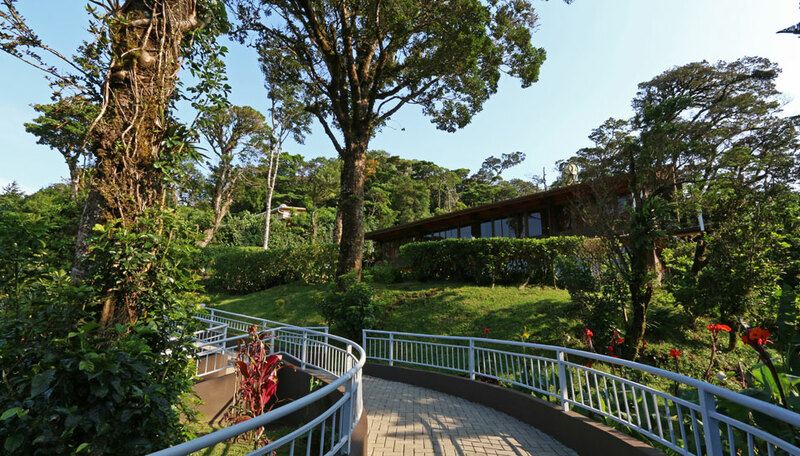 A welcoming, family-friendly lodge in lush gardens within walking distance of Monteverde Cloudforest Reserve. Monteverde Cloudforest, a 15 minute walk from the entrance to the reserve and a 15 minute drive from Santa Elena. Trapp Family Lodge is open year round. The architecture of this family owned and run lodge is reminiscent of an alpine chalet, with guest rooms arranged in 2 low rise buildings looking out over the gardens and towards the mountains. 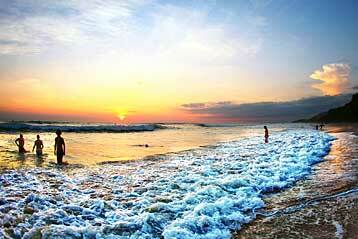 All accommodation is en-suite and has attractive local artwork, and these spacious rooms are ideal for families. You’ll be within a few minutes’ walk of Monteverde Cloudforest Reserve, where you can follow trails with a local guide to gain an insight into this mysterious and alluring world, and encounter some of its abundant animal and bird life. 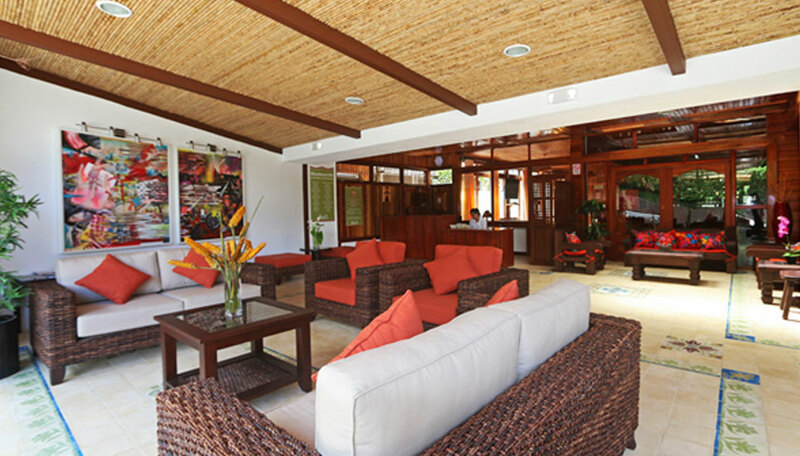 The lodge offers rest and relaxation, with a large lobby with sofas and coffee tables, a welcoming lounge-bar where you chat to other guests, and an adjoining restaurant serving international favourites. And yes, the owners are related to the Von Trapp family made famous by ‘The Sound of Music’! Why go to Trapp Family Lodge? 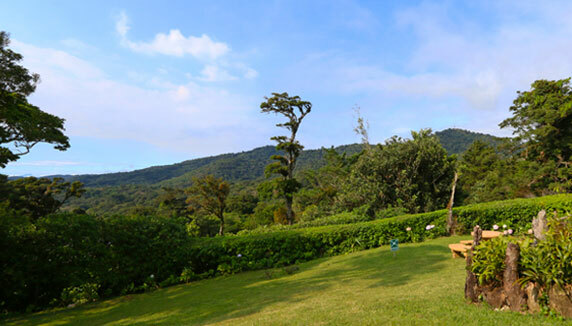 Trapp Family Lodge offers good value accommodation within an easy walk of Monteverde Cloudforest Reserve, so you can spend as much time as you wish enjoying its flora and fauna. The lodge has its own gardens, filled with luxuriant plant life including exotic orchids, where you wander at will and sit on the benches provided. 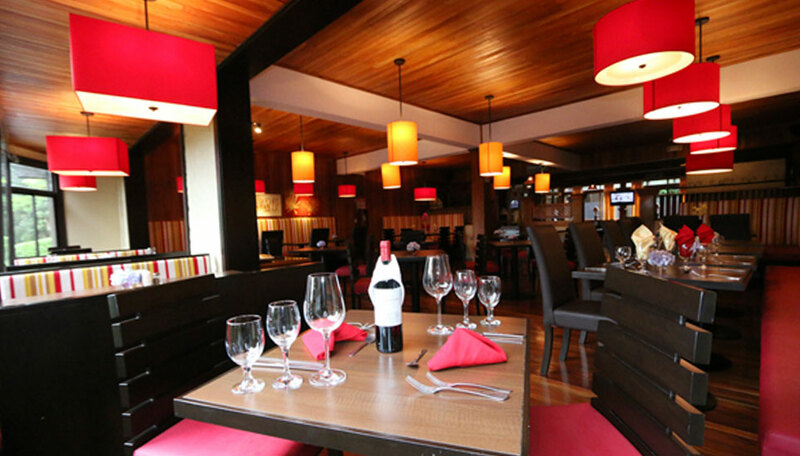 The lodge has a pleasant, homely feel, with an inviting lounge and restaurant, and spacious rooms. Families are welcome at Trapp Family Lodge, and children 5 and under stay free. 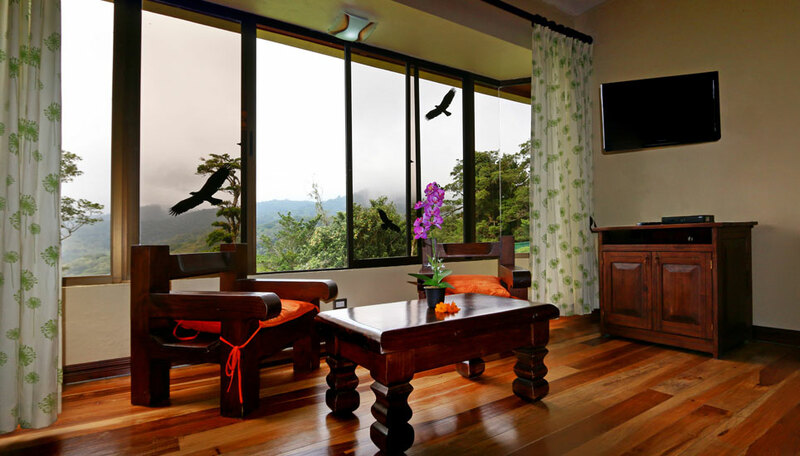 The lodge’s private reserve cloud forest is like a mini Monteverde, with plentiful bird and mammal life. With the main reserve less than 2kms away, so you can soon be enjoying encounters with some of the 400 species of birds, hopefully including the resplendent quetzal, capuchin and howler monkeys, sloths, tapir and cats. This is also a haven for reptiles and amphibians. There’s a special garden dedicated to hummingbirds a short walk from the lodge, too. Accommodation, daily breakfast, Wi-Fi internet access, car parking. There are 20 rooms, and 8 suites. All are spacious, have 2 queen size beds, a telephone, hairdryer, safe, and an en-suite bathroom with hot and cold water. They are decorated with local artworks giving them a homely vibe. Each of the rooms has a floor to ceiling window overlooking the gardens, while the suites have balconies with views of the mountain and forest, plus additional facilities including a TV and fridge. Children of all ages are welcome. Those aged 5 and under stay free. All of the rooms and suites sleep up to 4 people, so are suitable for families. There is free Wi-fi in social areas.